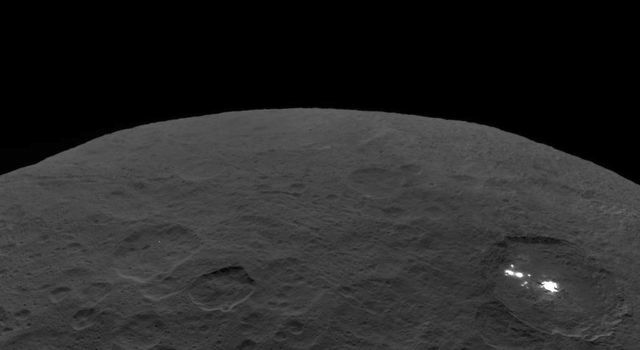 Continuing its ambitious campaign of exploration deep in the asteroid belt, Dawn has spent most of the past month spiraling ever closer to Vesta. Fresh from the phenomenal success of mapping the alien world in detail in October, the spacecraft and its human team members are engaged in one of the most complicated parts of the mission. The reward will be the capability to scrutinize this fascinating protoplanet further. 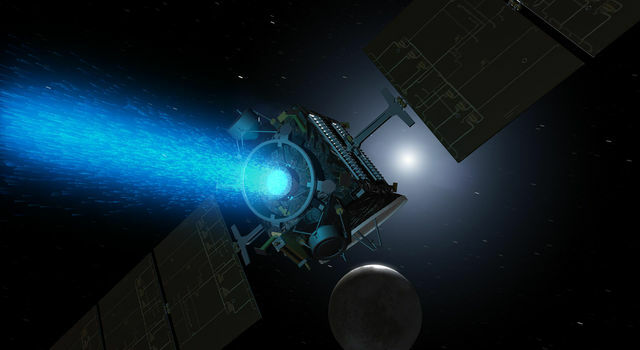 Thanks to the extraordinary performance of its ion propulsion system, Dawn can maneuver to different orbits that are best suited for conducting each of its scientific observations. The probe is now headed for its low altitude mapping orbit (LAMO), where the focus of its investigations will be on making a census of the atomic constituents with its gamma ray and neutron sensors and on mapping the gravity field in order to determine the interior structure of this protoplanet. As secondary objectives, Dawn will acquire more images with its camera and more spectra with its visible and infrared mapping spectrometer. As we will see in a future log, these measurements will receive a smaller share of the resources than the high priority studies. The spectacular pictures obtained already will keep scientists happy for years, and you can continue to share in the experience of marveling at the astonishing discoveries by seeing some of the best views here, including scenes captured during the spiral to LAMO. Planning the low altitude mapping orbit around massive Vesta, with its complicated gravity field, required a great deal of sophisticated analysis. Before Dawn arrived, mission designers studied a range of possible gravitational characteristics and honed the methods they would use for plotting the actual orbit once the details of the protoplanet’s properties were ascertained. In the meantime, the team used a tentative orbit at an altitude over the equator of 180 kilometers (110 miles). As explained in a previous log, the altitude varies both because the orbit is not perfectly circular and because Vesta displays such exceptional topography. The highest elevations turn out to be at the equator, and the average altitude of that orbit would be 200 kilometers (125 miles). Now that navigators have measured Vesta’s gravity, they have the knowledge to refine the design for LAMO, and they decided to raise it by 10 kilometers (6 miles). The target then is an average altitude of 210 kilometers (130 miles). But there is more to the specification of the orbit than simply its height. To meet all of the scientific objectives, the orientation of this orbit needs to be different from the orientation of the previous orbits, the high altitude mapping orbit (HAMO) and survey orbit. To picture the different orbits, let’s recall our discussion of how the orbit shifted from survey to HAMO. Readers unconcerned about the details of the geometry may safely (and wisely) skip this explanation. Think of Dawn’s orbit as a ring encircling Vesta, going over both poles and crossing the equator at a right angle. Globes of Earth often are supported by a ring like that, and it may be helpful to have a terrestrial globe in mind, or even in sight, as you ponder the celestial arrangement. For the purpose of this illustration, you may rest assured that no inhabitants (permanent or temporary) of Vesta will object if we pretend that the world does not rotate, so a ring that is aligned with a longitude line represents one of Dawn’s orbits. To start, let’s say survey orbit hovers over the 15 degree west longitude line (and, to make a complete circle, goes over the 165 degree east longitude line as well). HAMO would be shifted to 30 degrees west (and 150 degrees east on the other side of the globe). Dawn is now on its way to LAMO, which will be at about 46 degrees west (and 134 degrees east). The complex scheme for moving from HAMO to LAMO then involves not only lowering the altitude but also rotating the plane of the orbit by 16 degrees. We will delve into why this value was chosen after the spacecraft has arrived in LAMO. As long as we have used the globe to illustrate the orientation of the orbits, we can enhance the picture for those readers who want to sharpen their mental images of the geometry. Suppose Vesta, which Dawn has transformed from a smudge of light into a richly detailed world, is 30 centimeters (1 foot) in diameter. Even in this miniaturized universe, the sun is 199 kilometers (124 miles) away. (Space is big!) To get the alignments right, we will place the sun over (albeit very, very far over) the prime meridian, the 0 degree longitude line on our stationary Vesta. Setting the longitude of the sun is important here because Dawn’s orbits were chosen on the basis of their angles relative to the sun. Now we recall that Vesta, like Earth, has seasons because its axis is tipped. It is southern hemisphere summer there, so the sun is not over the equator; rather, it is at about 25 degrees south latitude. (On Sept. 1, when we first used the analogy of the globe, the sun was at 27 degrees south latitude. Since then, it has moved a little bit north because of the progression of seasons.) Although Earth’s location doesn’t matter for this discussion, we can accurately position it 204 kilometers (127 miles) away, high above a point at 26 degrees south latitude and 26 degrees west longitude. Survey orbit in this Vesta-centric universe is a hoop a little more than 1.5 meters (5 feet) above the 15 degree west longitude line (and, again, the 165 degree east longitude line on the night side). It was from that vantage point that the first thorough mapping was conducted in August. The ring representing HAMO is only about 38 centimeters (15 inches) over the 30 degree west (and 150 degree east) longitude line. The lower altitude of HAMO afforded much better views of the great variety of surface features than the reconnaissance from survey orbit. In addition, because the orbit was shifted farther from the sun, the angle of light on the landscape beneath the spacecraft was different, aiding in formulating a more accurate portrait of the terrain. Dawn is now nearing LAMO, less than 12 centimeters (only 4.7 inches) above the 46 degree west (and 134 degree east) longitude line. Although the ion propulsion system accomplishes the majority of the orbit change, Dawn’s navigators are employing another novel propulsion system as well: they are enlisting Vesta itself. Some of the ion thrusting was designed in part to put the spacecraft in certain locations from which Vesta would twist its orbit toward the target LAMO angle. As Dawn rotates and the world underneath it revolves (unlike the static picture we used to visualize the orientation of the orbits), the spacecraft feels a changing pull. There is always a tug downward, but because of Vesta’s heterogeneous interior structure, the product of its complex geologic history, sometimes there is also a slight force to one side or another. With their knowledge of the gravity field, the team plotted a course that took advantage of these variations to get a free ride. This is akin to experienced sailors not only relying on their ships’ engines but also following routes that use known currents to let nature do some of the work. Of course, sailors benefit from knowledge of currents measured by those who plied the waters before them. Dawn is the first, venturing boldly into mysterious seas never visited before. But the measurements of the gravity field in HAMO, even though it was at a higher altitude, gave navigators enough information about what lay ahead on the horizon that our vessel could safely and productively ride the gravitational currents. The flight plan from HAMO to LAMO then is a complex affair of carefully timed thrusting and equally carefully timed coasting. Under ion thrust, the spacecraft flies to a certain location in a certain orbit at a certain time, waits a certain interval as Vesta propels it to the next waypoint, and then it resumes thrusting. This itinerary was worked out in exquisite detail when Dawn was still in HAMO, but it is impossible to follow the mathematically perfect path. Although navigators measured the gravity field, they were not able to detect all of its convolutions, so the ship is subjected to slightly different currents from those expected. Occasional firings of the spacecraft’s small jets and tiny discrepancies between the planned strength of the ion thrust and the actual value contribute more to the deviation of the trajectory. Mission planners studied these and other effects thoroughly and have been well prepared to account for all of them. Every few days during the spiral transit from HAMO to LAMO, the spacecraft points its main antenna to Earth so navigators can get an accurate fix on it. The time for radio signals (traveling, as all readers can attest, at the universal limit of the speed of light) to make the round trip allows them to measure the probe’s distance. The slight change in the frequency of the signal, known as the Doppler shift, reveals how fast the craft is moving. Combining these with their best mathematical description of the gravity field and other data, as well as the plan that is onboard for upcoming thrusting and coasting, they determine Dawn’s orbit and calculate where it will be at a certain time in the future. For most of the way between HAMO and LAMO, that time is three days, which is just long enough for the entire operations team to perform an intricate set of carefully choreographed steps. While all of that is taking place at JPL, Dawn is continuing to fly around Vesta, carrying out the previous set of instructions it received to thrust and coast. Right on schedule, the team completes the work, including all the diligent checks to make sure every detail is right, in time to transmit the new sequence to the adventurer when the one already onboard calls for it to turn its main antenna to Earth once again. Almost as soon as the process is finished, it starts again, with a measurement of Dawn’s latest orbit. In some of the more dynamic parts of the transfer from HAMO to LAMO, three days is too long to let the spacecraft fly on its own without an update to the plan, so the team had to do all that work in two days. Thanks to the meticulous planning, preparation, and rehearsing, this complex work has been conducted with the smooth professionalism that has characterized the entire mission. 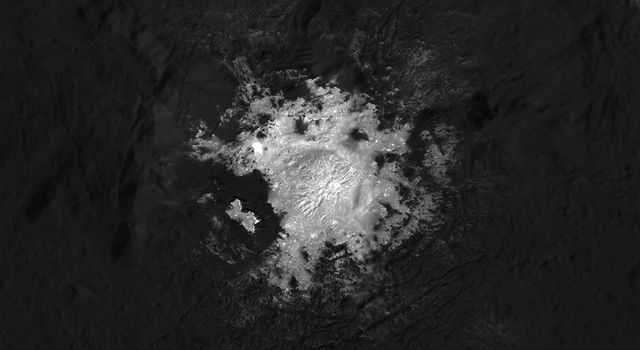 As a result, Dawn remains on course and on schedule to begin its scientific observations in LAMO on December 12. Very far from home, the spacecraft is making excellent progress in its expedition at a fascinating world that, until a few months ago, had never seen a probe from Earth. This unique mission to a place unlike any that has been visited before has already produced a tremendous bounty of fabulous pictures and other important scientific data. Soon it will be ready to undertake a new phase of exploration, revealing ever more about this behemoth of the asteroid belt. Both patient and ambitious, Dawn plumbs the depths of alien waters, stirring the imagination and nourishing the spirit and the mind of everyone on distant Earth who ever gazes at the sky in wonder or who longs to know the cosmos. Dawn is 240 kilometers (150 miles) from Vesta. It is also 2.41 AU (361 million kilometers or 224 million miles) from Earth, or 935 times as far as the moon and 2.45 times as far as the sun today. Radio signals, traveling at the universal limit of the speed of light, take 40 minutes to make the round trip.